My daughter wanted a Gone with the Wind birthday party! 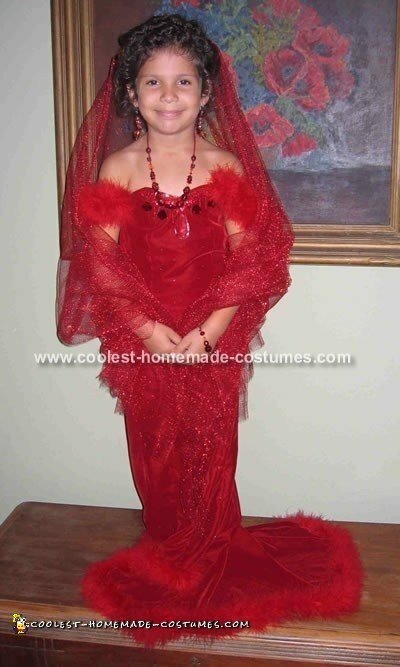 I bought red velvet material, red feather material, red sequins, red beads and some fake jewels as well as red gauze-like material that had some sparkles for the wrap I used a doll’s dress as a pattern and measures my daughter to fit. I sewed the dress like a strapless evening gown. I then attached the feathery material for the off the shoulder sleeves and along the back train of the dress. I sewed sequins with beads randomly over the front of the dress and the large fake jewels along the neckline. It took a while but was pretty easy. I did add a zipper to the back so that it would be easier to get in and out of! My daughter loves it and she wears it all the time!